What are on-premise and cloud-hosted systems? One of the biggest decisions you will make when selecting new software for your organization is whether it will be installed on-premise or cloud-hosted. On-premise UC system reside on a dedicated server maintained by an organization's IT department. This provides additional control and validation but requires hardware to set up and a dedicated IT department to manage everything. Cloud-hosted UC service reside on a third-party cloud service provider (CSP) and require an Internet connection for access. Most cloud-hosted software services include updates, backups, monitoring and upgrades at no additional charge. Initial cost Your organization will pay licensing fees to own the software. Payment is upfront, so you can expect a fixed price. Your organization will pay licensing fees to use the software. Depending on the CSP, payment terms can be pay-for-usage, pay-per-month, pay-per-user, etc. Subscription fees can increase over time. IT infrastructure Your organization will have to provide its own servers, hosting, backup, internal network connection, Internet connection, and other hardware and software as needed. Your organization will need to invest in a high-speed Internet connection to maximize the cloud functions. Customization Customization is in-depth per the needs of your organization. Customization is limited and dictated by the CSP. Control Your organization will have control over its data and the whole system. Your organization will hand over control to the CSP. This includes giving the CSP access to your organization’s data. Implementation You will have to wait for the IT staff to complete the integration, with a wait time that is dependent upon the complexity of the IT infrastructure. Implementation time is typically brief because the CSP will handle everything. IT support Your organization will have to create a team of dedicated IT staff to address maintenance and support issues. Your CSP will handle a majority of the IT support as a part of their service package. Security Because data is stored on site with internal-only access, fewer security risks are involved. Your organization can restrict access to suit its needs. Internet-accessible data has greater inherent risks. Your organization must choose a CSP that offers reliable security. No matter which installation method you choose, either method sets high thresholds for terminal devices. Stability,compatibility, security level and functionality are key factors to consider when purchasing. Yealink delivers terminal solutions that cover various demands for enterprises and service providers. Its high quality and stability boast an average false rate under 3‰, even in frequent daily use. Excellent compatibility gives our clients peace of mind even when switching between on-premise and cloud-hosted solutions. ● SIP standards-based Yealink IP phones register effortlessly with IP PBX servers, allowing extension-to-extension dialing, multimedia calls (voice and video) and other functions. ● Yealink IP phones support PBX functions and bring advance functions into full play, including BLA/BLF, Intercom/Paging,Call Park, Call Pickup, Call Return and more. 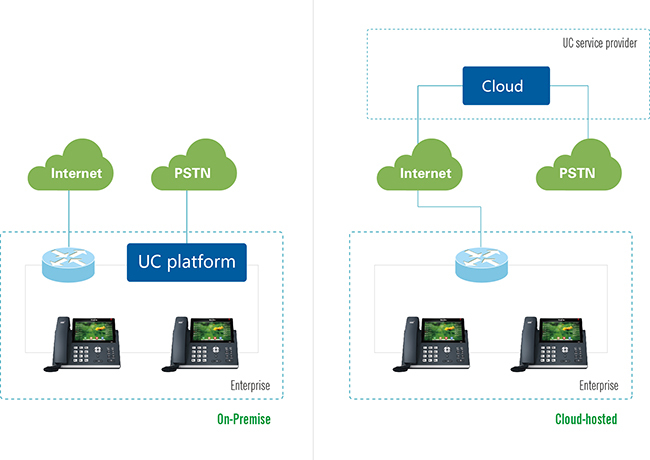 ● Yealink IP phones feature plug-and-play deployment. Simply by selecting Yealink’s IP phone model in IP-PBX system, auto provisioning(mass deployment) of IP Phones can be achieved, saving considerable time and human resources. ● With the open XML API, Yealink allows for the in-depth customization of the functions and interface of IP phones. ● Comprehensive functions for hosted PBX, including: forwarding/DND, BLF/SCA, network calls, log/phone book, network conferencing and more. ● Auto-deployment, plug-and-play.Users benefit from Yealink’s free Redirection and Provisioning Service (RPS).After the phone is unpacked and powered on, the phone is redirected to its pre-assigned server for configuration updates. The “zero-touch” Mass Deployment brings benefits far beyond savings in time and money. ● High security. Security for IP phones requires special attention because the network interface used by the phone provides an access point to the rest of the network. Yealink IP phones support provisioning via encrypted configuration files as well as HTTPS protocols, safeguarding users’ accounts. User calls are encrypted and protected via TLS and SRTP. The system supports 802.1X, VLAN and VPN to boost security. Yealink ensures our customers do not need to compromise on IP phone security.